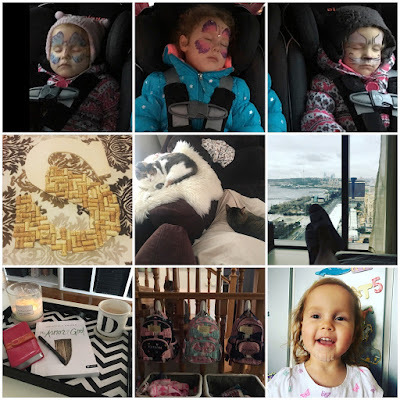 This month had a lot of changes and milestones in it. It also flew by quickly and I sit here in disbelief that tomorrow is February 1st. 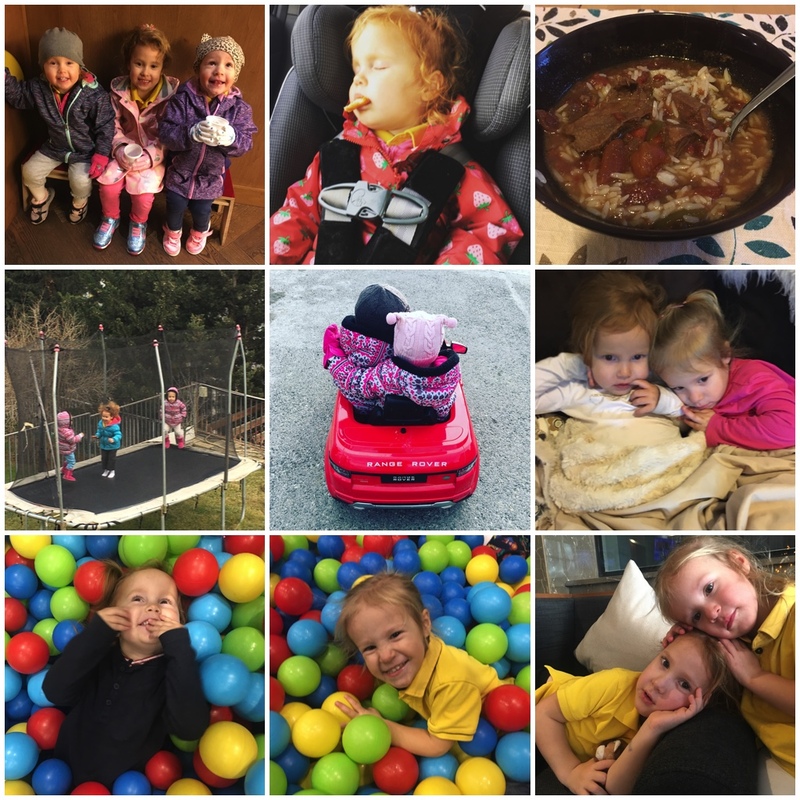 The biggest thing that happened this month was the twins finished potty training and started Montessori! It was not an easy task undertaking two toddlers to use the potty, but they have done pretty brilliant and I am super proud of them. They've also done really well adjusting to school! We did a slow transition the first couple of weeks so there was lots of time for the playground at home. However now they are staying through lunch and outdoor playground time! We started Jan 1 with the traditional Southern black-eyed peas and cornbread. Yum! I brought the girls back Dunkin Donuts from my girl's trip to Georgia. Delicious, but caused Evy to ask for donuts regularly for about a week after they were gone and cry huge tears when I said I didn't have any. Playground snack time during their transition to school. I have a posse of monkeys. Evy cuddles with Tata and baby turtle. A bonus drop off with Dad to school one morning. I have no idea what Olivia is singing... but she's dang adorable. "Take our picture Mom! Cheese!!" It's been super cold here (finally feeling like winter!) so we've done loads of soups in the crockpot. Beef and vegetable stew. But the cold hasn't stopped these three from playing outdoors and jumping like crazy! We splurged and took the girls to Wonderland after school one day. Ball pit heaven. We officially started swim lessons for the twins, and had some rest and snack before they started. Madi is still a pro and the twins have only had one lesson, but Evy loved it and Liv (who is normally our water baby) was a bit apprehensive about the cold pool, but still gave it a good try. One of the things we love about living overseas is experiencing different cultures. The traditional Azeri breakfast in Old City is definitely my favorite thing to do when we have visitors. 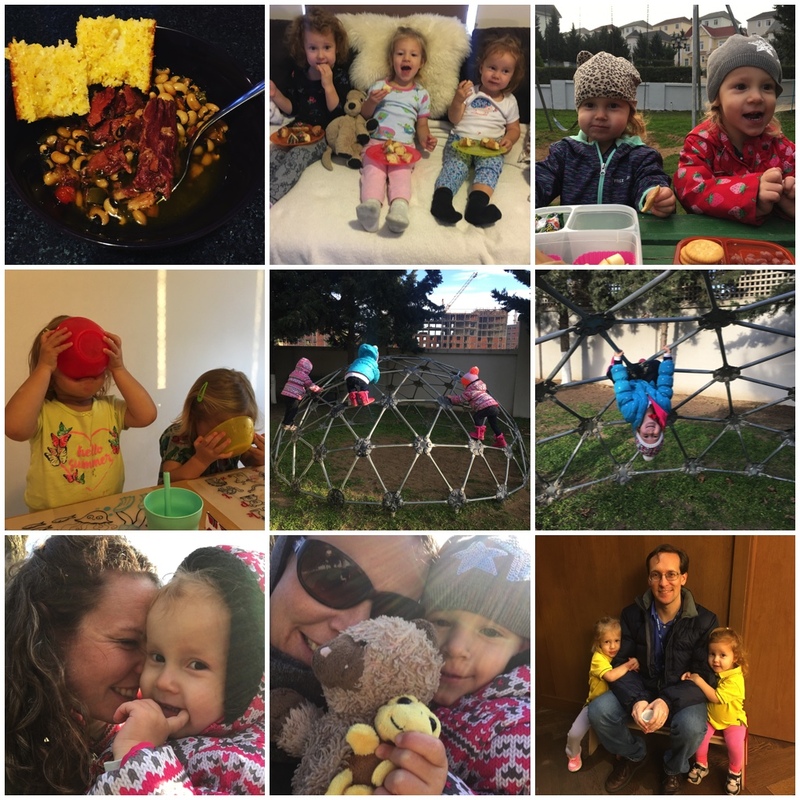 One weekend we decided to go ahead with the girls and then walk around Old City afterwards (and ended up buying two carpets, which I love!). Tea is part of the culture here in a way that us Americans don't understand. 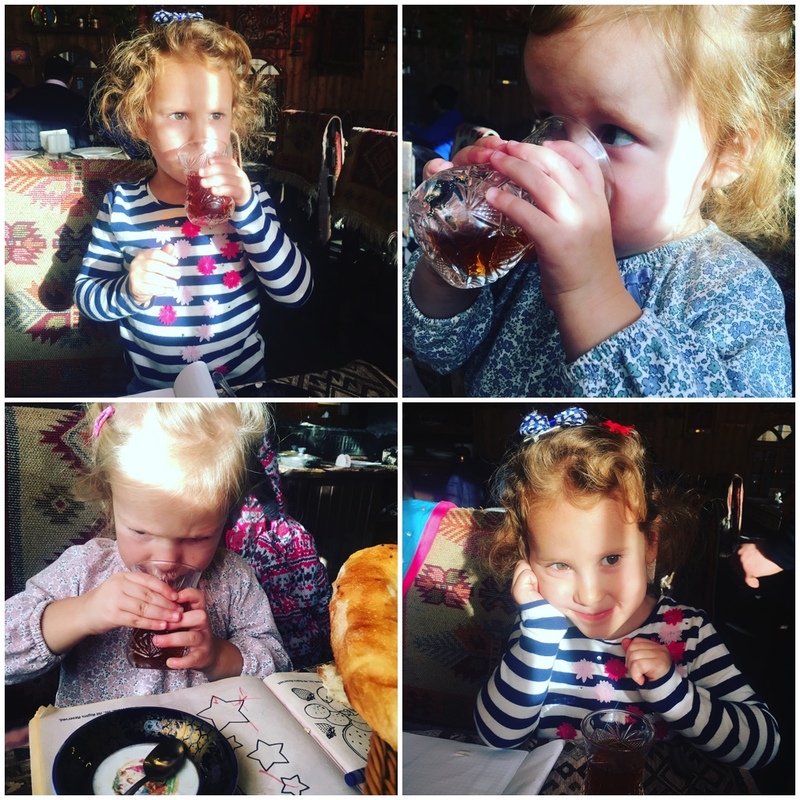 Tea is had with guests and served with sweets and it's not unusual to see babies with tea instead of milk or juice in their bottles. The waiter automatically set tea glasses out for the girls when we ordered a pot and they all had some. Olivia loves it the most, but the others drank most of a glass as well. Exhausted butterfly after a birthday party. Another exhausted butterfly after the same birthday party. A sounds asleep kitten after the birthday party. Sigh. This was no bueno for bedtime. We were a bit ambitious on the sizing of our letter S and have discovered we are sorely short of wine corks to finish this DIY project. Cats co-habitating. This might not seem unusual given I have previously posted pictures of these two snuggled together. However, this is major people. Around the end of November their fighting escalated to the point where they could not be in the same room together. We have kept them separated with failed attempts to re-introduce them all during December. CeCe would hiss and growl as soon as she saw Zoey and Zoey would follow her and attack after being hissed at until she chased CeCe and cornered her. It has been awful. I finally got them to the vet and was told there is nothing physical so it's behavioral and no other assistance. I finally said I'd had it and have forced them to get along by watching them closely and verbally reprimanding when they begin to fight. It's been so-so. They aren't back to normal - more like a divorced couple co-habitating and tolerating the others presence so long as they don't come close. Any tips or advice is greatly appreciated!! I got spoiled with a spa day all to myself - a scrub, massage, and facial along with hot tub relaxing beforehand. It was bliss! How I'm spending my current free time. :-) I was thankful to get back to Bible study on Thursdays. Jason leaving sweet notes for his girls on their backpacks. Olivia decided to finish the month off with a bang. I was called yesterday on my way to school and asked to hurry because Olivia had fallen and needed to go to the doctor. I was able to leave her sisters at school for a bit longer and take her over to the doctor where we opted for glue over stitches. She handled it like a champ and impressed the staff by calling them doctors, listening to their instructions, and telling them exactly how she was climbing a wall on the playground and slipped and fell and cut her chin on the bench and there was blood on her shirt and coat. She was the talk of the ER!